There are times in the last three months that I would have crawled over broken glass for a taste of fish. If my right arm had been made of fish instead of meaty flesh (or should that be fleshy meat?) then I probably would have gnawed on that. That’s what a two-week diet of nothing but meat and potatoes does to a person. At that moment, if somebody had produced a plate of steamed fish, I would have considered something close to a miracle. Hell, I might even have converted on the spot. But they didn’t, and I didn’t. Instead, that need just quietly grew. And so, it was with what I felt was quite reasonable joy, that I stood in the fishmonger, staring with open-mouthed with mute happiness at all those scales gleaming in thin grey-tinged light of a Hackney morning. I sauntered out with a fresh-faced bright eyed beauty of a sea bass. It may be unfashionable, but it’s still a fabulous fish to cook with. In my limited experience, no one steams fish as well as they do in the far east. The best steamed fish I have ever eaten was in some nondescript Thai riverside town.I was totally unprepared for the dish of softly steaming joy that arrived in front of me. It was full of aromatic flavours and yet surprisingly subtle. This is what I’m aiming for here. It’s important to use a fish that stands up to the flavours of chilli and lemongrass, garlic and ginger. But you also want one that isn’t too oily so that the dish keeps it’s clean taste and feel. So sea bass or bream are perfect for this. Trout, mackerel and salmon are too rich, you ‘d want to fry them instead. Cod and haddock, as well as being unsustainable, tend to be overwhelmed by all those exciting additions. 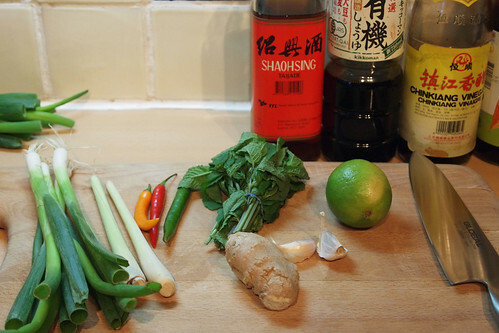 Fish sauce, as ever, adds a certain umami-ish flavour to affairs, as well as being transmogrified by the fishy juice and splash of soy and rice wine into an unreasonably tasty sauce. 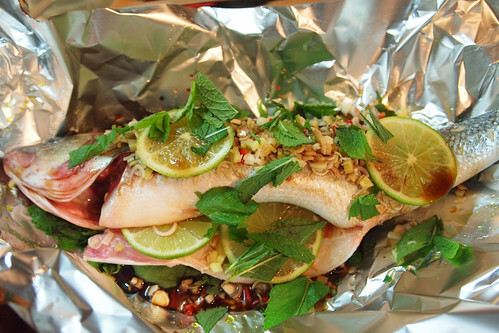 Wrapping the fish in foil allows it to steam in its own juices without losing any flavour. And those aromatic additions infuse the flesh with hints of jungly river banks and ruined temples. Serve with something simple and green, spinach, choi sum, tender stem broccoli, that sort of thing. Add rice if you want to make it more substantial. But nothing that will take over and dull the subtle flavours of steamed fish. 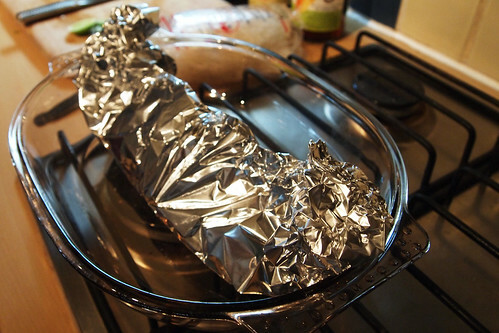 Line an oven-proof dish with a large sheet of foil and brush with oil. Combine all the chopped and sliced ingredients and put half in the bottom of the dish. Put the fish on top and spread the rest of the chopped ingredients over the top. Pour over the sauces, rice wine and vinegar. Fold the foil over the top and crunch in the ends to form a steam-proof packet. Bake in the oven for 35-40 minutes. 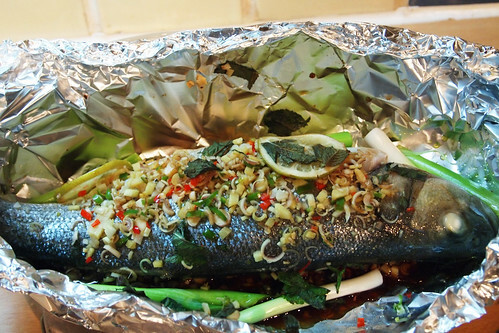 Remove, open the foil carefully and take a deep breath of the aromatic steam. Serve with green vegetables and pour the thin sauce over the top. This is the sort of meal I want to have after a hard day at work, easy to prepare, not too heavy and packed with flavour. Not familiar with Chin Kiang rice vinegar, it’s more intense than shao xing? I can just imagine the aroma, if only you could smell blogs (scratch ‘n’ sniff for the 21st Century – get working on it, Apple boffins). BTW, when did sea bass become unfashionable? It’ll always be my number one (the wild stuff that is and not the farmed crap). Looks delicious and a definite Must Try. 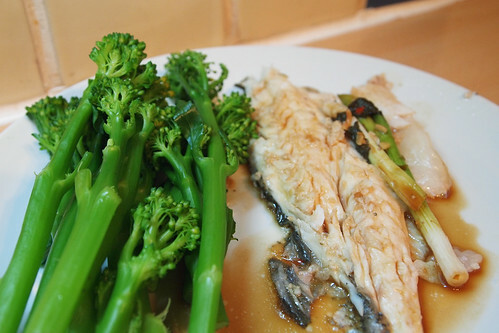 I love steamed fish like this – also, a favourite is to do it Cantonese style i.e. steam the fish and then pour sizzling oil over ginger and spring onion, then over the fish. @Mr Noodles – that would make blogs much more attractive (and me much fatter as I would be constantly popping out to eat after reading a blog). Re sea bass, i have heard many a moan and groan about sea bass appearing on menus. I think it must be its ubiquity. @Lizzie – I love that idea – kind of like what you do with dahl as well. That would add some properly good flavours to it. that’s a gorgeous fish. and i see you use all the same condiments/ingredients as i do- down w/ pre-prepared sauce mixes! Gorgeous. Would love some now. I’m joining Mr Noodles’ protest re: seabass. One man’s unfashionable is another little glutton’s CLASSIC And YES to line caught wild bass vs the mushy bland farmed stuff. The difference in taste and texture is pretty astounding. @Shayma – there is little point in using pre-prepared sauces if you can get your hands on these, they are so easy to use. @Going with my gut – Get thee home and start steaming ;D And I am with you about the bass. Like pork belly there is a reason it became ubiquitous. It’s a damn fine fishy.